Sleepeez is a specially designed combination of herbs and nutrients essential for supporting the nervous system and sleep patterns. It contains sedative herbs that are beneficial for sleep disorders caused by anxiety, stress and irritability. Adults – Take 1-3 tablets one hour before bed, or as professionally recommended. This product contains tableting aids and coating colour. Some herbal extracts used. Seek professional health advice if taking medication, suffering a medical condition; if lactating, pregnant or a child before supplementing. In rare cases, some ingredients may cause an allergic reaction. Valerian is native to Europe and North America. It has a long tradition of use as a sedative and tranquiliser. It has been used widely to relieve anxiety, lower blood pressure, enhance the flow of bile, and relax intestinal and other smooth muscles. As an insomnia aid, valerian decreases the time taken to go to sleep and improves sleep quality and length. A double-blind, cross-over, controlled study was designed to evaluate the hypnotic effect and safety in patients with insomnia. Twenty patients were included in the study and the procedures were conducted on four consecutive nights of 8 hours each. In a sleep laboratory, polysomnographic (PSG) recordings were performed for analyzing the quantity and architecture of sleep as well as evaluating morning sleepiness, memory quotient and side effects. Based on the PSG results, valerian reduced the number of awaking episodes and increased the rapid eye movement sleep. The sleep efficiency index was increased. The tests also showed valerian produced beneficial effects on sleep architecture and reduced notoriously the morning sleepiness. Valerian did not affect anterograde memory and slight side effects were observed. In general, the results support the hypnotic effect and safety of acute treatment of valerian on patients suffering insomnia. Hops are highly valued for their medicinal properties that include sedative, soporific, diuretic and antibacterial effects. It is commonly used for insomnia, restlessness and nervous tension. Hops also help to relieve muscle spasm and act to improve digestion and therefore are beneficial for irritable bowel syndrome, inflammatory bowel disease and dyspepsia. In Switzerland, a pilot study was conducted to investigate the effect of a fixed valerian-hop combination on sleep polygraphy in patients with mild-moderate, non-organic insomnia. Thirty patients were involved and they were given two tablets of valerian and hop each evening for two weeks. The diagnosis was confirmed by polysomnographic standard examinations before and after the treatment. The examination revealed the combination of valerian and hop declined the sleep latency and the wake time and consequently increased the sleep efficiency. The patients judged their being refreshed in the morning by assigning a rating of 1 to 6. They reported an improvement after 2 weeks of treatment and no adverse events were observed. These findings suggest the combination of valerian and hop can be useful for individuals suffering from mild-moderate insomnia. Passion flower has been used as a medicinal herb since late 19th century in the United States. It has a historical use in nervous restlessness and gastrointestinal spasms and its current use is as a mild sedative. Passion flower was believed to have effect primarily on the nervous system, particularly for anxiety due to mental worry and overwork. The efficacy of passion flower was studied in a pilot double-blind, randomized, controlled trial compared with oxazepam in the treatment of generalized anxiety disorder (GAD). The study was performed on 36 out-patients diagnosed with GAD and they were randomly allocated to passion flower or oxazepam for 4 weeks trial. At the end of the trial, both passion flower and oxazepam were effective in the treatment of GAD and no significant difference was observed between the two protocols. Although oxazepam showed a rapid onset of action, it caused significantly more problems relating to impairment of job performance. The results demonstrate that passion flower is an effective herb for the management of GAD, and the low incidence of impairment of job performance with passion flower compared to oxazepam is an advantage. Hence passion flower is beneficial for those with sleep problems that are associated with anxiety. Skullcap is valued for its effects as a nervous system tonic. It is used traditionally for anxiety, depression, insomnia, headaches and premenstrual syndrome. Wolfson and Hoffmann designed a study to clarify the effectiveness of skullcap in reducing anxiety. This double-blind, placebo-controlled study demonstrated noteworthy anxiolytic effects in healthy subjects. Therefore, the use of skullcap has been shown helpful for anxiety and other nervous disorders. 5-HTP (5-Hydroxytrytophan) is naturally found in the seeds of Griffonia simplicifolia, a West African medicinal plant. The human body manufactures 5-HTP from L-tryptophan, a natural amino acid found in most dietary proteins. 5-HTP is used by the human body to make serotonin, an important neurotransmitter for normal nerve and brain function. Serotonin appears to play significant roles in sleep, emotional moods, pain control, inflammation, intestinal peristalsis and other body functions. An Italian study was carried out to test the effects of administration of 5-HTP in children with sleep terrors. Forty-five children affected by sleep terrors were participated in this open pharmacological trial and were into two groups, 5-HTP or placebo. All subjects underwent complete medical and sleep history, complete neurological examination and EEG recording, and a sleep diary. In the group treated with 5-HTP, 94% of the children showed a positive response after 1 month of treatment and 84% of the children were sleep terror-free after 6 months. In the placebo group, episodes disappeared in 29% of the children after 1 month and 71% of children continued to show sleep terror at 6-month follow-up. These results confirm that 5-HTP is able to modulate the arousal level in children and induce a long-term improvement of sleep terrors. Magnesium is one of the most abundant minerals in soft tissues. It is involved in the metabolism of food components, formation of new compounds essential for good health, protein synthesis, DNA manufacture, fatty acid synthesis, anaerobic breakdown of glucose and the removal of toxic substances from the body. Magnesium is also vital for healthy bone structure, nerve impulse transmission, interaction with calcium and hormone action. This mineral has been reported to have n-methyl-D-aspartate (NMDA) –antagonistic and gamma-aminobutyric acid (GABA)-agonistic properties and the modulation of NMDA and GABA-dependent system is involved in pharmacological treatment of affective disorders. The effect of magnesium on sleep electroencephalogram (EEG) and nocturnal hormonal secretion was studied in 10 normal controls. These men were given magnesium or placebo according to a randomized schedule. The sleep EEG was recorded and blood sample were taken for analysis. The results showed a significant increase in the third sleep cycle and plasma corticotrophin concentration was suppressed. It was found that magnesium has NMDA-antagonistic and GABA-agonistic effects on sleep and nocturnal hormonal secretion and hence may be useful in controlling affective or depressive symptoms which may induce sleep problems. Calcium is the most abundant mineral in the body. It is essential for healthy bones and teeth, muscle contraction, blood pressure regulation, blood clotting, and healthy heart and nervous system. A clinical study investigated the deficiency of calcium and supraorbital headache. Several adult patients with meuromuscular hyperexcitability, anxiety, dysautonomia and oculofrontal headache were subjected to a series of ion and hormone blood tests, and the results were compared with those in control subjects. It was found that calcium level was significantly decreased. Hence, calcium is an important mineral for the brain and nervous system. Niacinamide, also known as niacin or Vitamin B3, is vital for normal growth and development, hormone production, repair of genetic material and healthy skin, blood cells and digestive system. It is also essential for the normal functioning of the brain and nervous system. Russian researchers studied the effect of niacinamide on the uptake and release of serotonin and GABA in rats with diabetes. It was found that niacinamide administration restored serotonin uptake up to control levels, while the GABA uptake tended to decrease in rats. With the niacinamide dose studied, the partial restoration of serotonin and GABA release was achieved. Having these restoration effects, niacinamide may be recommended for those with low serotonin levels which is commonly found in individuals with sleeping disorders or neurological problems. Pyridoxine, also known as Vitamin B6, is essential for the release of energy from food, protein metabolism, hormone production, synthesis of genetic materials, and healthy skin, hair and red blood cells. It is also important in maintaining healthy cardiovascular, nervous and immune systems. Bernstein AL from Department of Neurology in Kaiser Permanente Medical Center, California, has reviewed pyridoxine in clinical neurology. Headache, chronic pain and depression appear to run altogether in many patients. The observations that serotonin deficiency is a common thread between them and that pyridoxine can raise serotonin levels open a wide range of therapeutic options. Serotonin is a neurotransmitter involved in sleep, depression, memory and other neurological processes. In summary, Sleepeez contains herbs and nutrients that have sedative and hypnotic effects. The ingredients help to improve sleep quality and length, reduce time taken to go to sleep, relieve anxiety, aid serotonin production, and support the function of the nervous system. 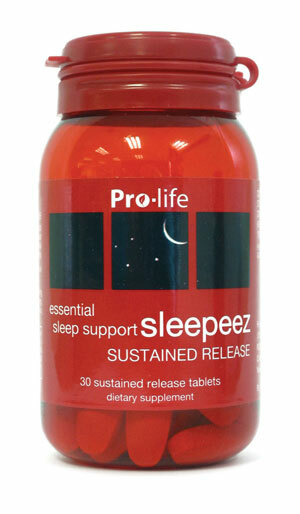 Sleepeez is beneficial for those with sleep disorders caused by anxiety, stress and irritability.